Hopping off the plane to Melbourne, we were greeted by a blast of icy wintery air. That didn't stop us from picking up our rental car to head up to the spa capital of Victoria - Daylesford. But on the way, we had to pick up a little lunch to quiet and warm our stomaches. Without a plan, we plugged in our Navman to the resort and hoped to find something along the drive. Which turned out to be Woodend, a quaint little town in the Shire of Macedon Ranges. Although it was originally part of the gold rush back in the 1800s, it is now a bit of a tourist destination. 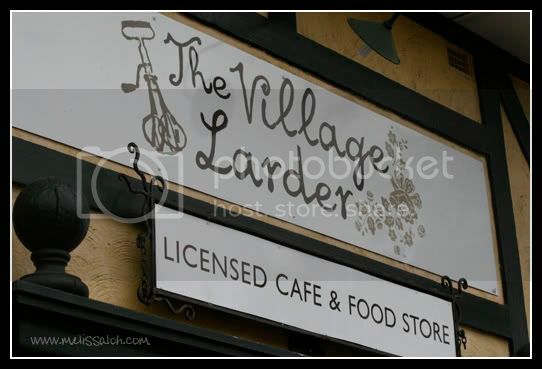 Walking down High Street, we noticed the glass window wall of the Village Larder. The patrons looked happy and toasty warm, tempting us to join them inside. And I'm glad we did. We're greeted by a waiter who offers us the biggest warmest smile and waves for us to sit anywhere we like. The furnishings are include worn wood tables, mis-matched chairs that look like they're from the 70s and 80s. 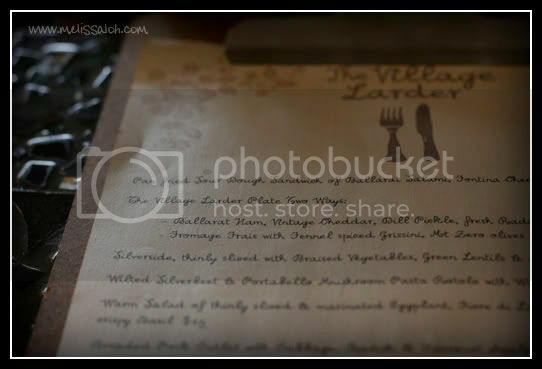 Menus are printed on a creamy textured paper, but keep your eye out for the specials written on the chalkboard on the corridor wall or the roll of brown paper hanging in the main cafe area. 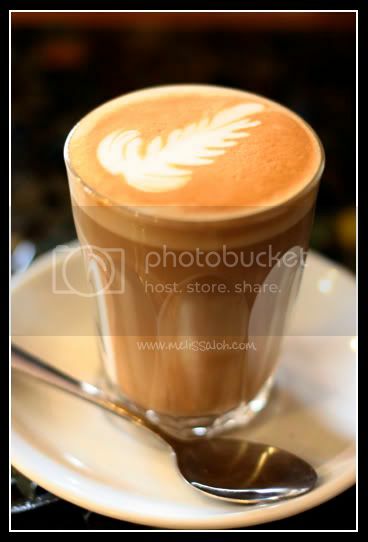 The SO started with a latte and it isn't often we get treated with a touch of coffee art. The coffee is smooth and really good too. With the SO being sick, he opted for the soup on special. And this is absolutely beautiful. 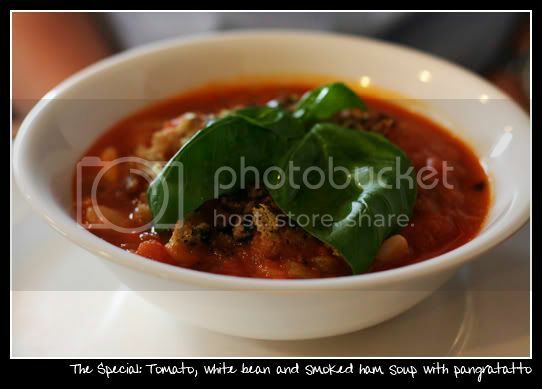 The soup is so rich with tomato and thick with finely diced fresh vegetables, it's almost a stew. And the white beans still retained their firmness, so obviously hadn't been mashed up from overcooking. And hiding just beneath the palm-sized basil leaves, was the crunchy pangrattato crust. Pangrattato is basically breadcrumbs fried in flavoured oil, and in this case, I think the olive oil is infused with garlic. In the olden days in Italy, pangratatto was used as a substitute for parmesan, as the peasants could not afford cheese. And since cheese can still be a little pricey for some pockets, this crunchy alternative is a good idea to keep in mind. I on the other hand, was tempted by their fridge display selection and opted for their egg and bacon pie. 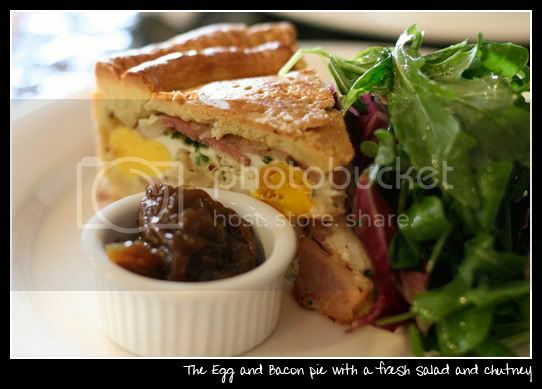 Served warmed through with a fresh salad of lettuce and rocket in a refreshing dressing, and a dollop of chutney, the buttery pastry holds the hard boiled egg and bacon together in a shiver-worthy sinful treat. And as if their cafe style offerings aren't enough, they also have a basket full of sourdough bread and other produce selections for sale. Not surprising, seeing as they have Daylesford Macedon produce pamphlets on the counter. Daylesford Macedon produce is a group established to nurture, develop and market the growers, winemakers and food producers of the Daylesford and Macedon Ranges Region. So when you're planning your next road trip, think about not planning it. You never know what you'll find, like this little treasure trove. It is! I'm so tempted to try making one at home. This page was loaded Apr 26th 2019, 12:37 pm GMT.